Have you ever had performance issues with MongoDB? Did you find a quick and universal solution to boost your database server? Regardless of whether you answered yes or no, this article is for you. After working with MongoDB for over 7 years, I’ve compiled a list of 7 angles from which to approach a performance issue with your MongoDB application. According to Von Neumann architecture, there are 3 main components that are key elements of a performance server. CPU: MongoDB uses as many CPU’s as your server has. As of version > 3.X, it offers concurrence on document level. Operations handled on CPU are: page compression, data calculation, aggregation framework, map reduce, etc. RAM: Plan your server RAM sufficient to fit at least your indexes in memory. The best performance you’ll achieve is when and if your memory can fit both indexes and the working set of data for your application. I/O devices: It’s important to have a highly available application, thus plan to have a disk with higher IOPS coefficient. To measure DISK performance in terms of MongoDB application, use the mongoperf utility that comes in the default bundle of MongoDB executables. Starting with version 3.0, MongoDB came with a new storage engine called WiredTiger. This engine uses document-level concurrency control for write operations. As a result, multiple clients can modify different documents of a collection at the same time. Next to the document level concurrency control it uses MultiVersion Concurrency Control (MVCC). 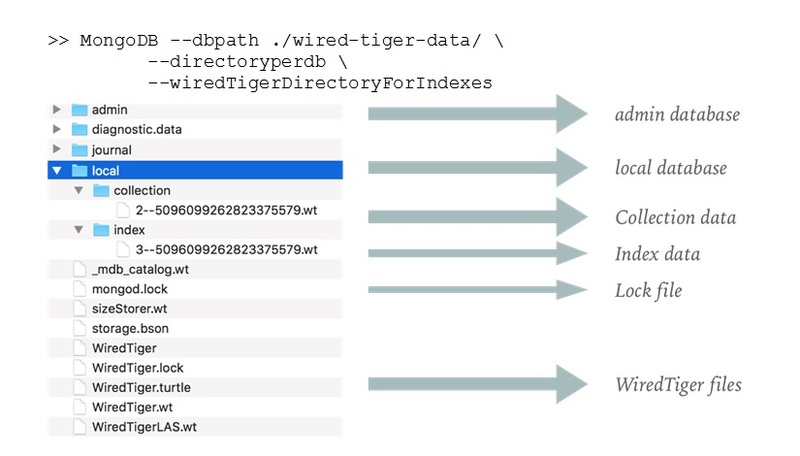 At the start of an operation, WiredTiger provides a point-in-time snapshot of the data to the transaction. A snapshot presents a consistent view of the in-memory data. Last but not least, this engine uses a write-ahead transaction log in combination with checkpoints to ensure data durability. This behavior may be customized by using different parameters for MongoDB daemon startup. Using the second method of MongoDB daemon startup, we force our server to save database and index files in separate directories. This strategy allows you to host files either on different partitions or even on different disks. This trick provides flexibility in choosing sufficient IOPS for the data you host. Having well-tuned hardware does not mean that your MongoDB is at peak performance. It’s time to tune your data. MongoDB comes with the following list of indexes: single field index, compound index, partial index, sparse index, text index and unique index. Each of these is suited for a specific range of search operations. Please refer to the official MongoDB documentation for more detailed information on indexing. The MongoDB query optimizer processes queries and chooses the most efficient query plan for a query given the available indexes. The query system then uses this plan each time the query runs. The following diagram illustrates how a query planner works. 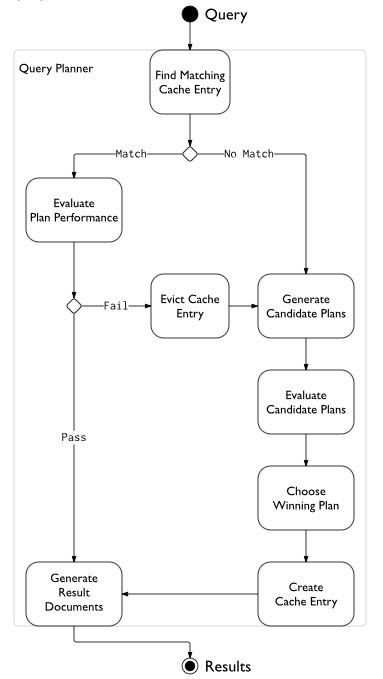 The winning query plan is selected using a built-in empirical model. This is why a first query may run upon an index and the second time, the same query may use a different one (ex. your database data changes over time). Be careful in your usage of hints, though – as there are very rare cases when explicit index hinting outperforms MongoDB’s query planner model. And the suffix of the index should be compound of the fields that do range operations. While there is no universal solution to all MongoDB performance issues, these tips will boost your overall application performance. This list comes from my 7 years of personal experience of MongoDB usage. There are many other tips that may be applicable to your project not mentioned in this post and I’d love for you to share them in the comments! Check out Pentalog’s events where we discuss about development, QA & devops topics. Read this technical article that shows you step by step how to develop microservices in NodeJS.